A medical abortion is generally a safe procedure that carries few risks. It is important to know what to expect after an abortion, including the recovery time. In this article, we talk about what to do after an abortion and when to see a doctor. We also provide some self-care tips. The US political war on women has reached an all-time apex, and women�s health physicians must speak out loudly on their behalf. An abortion is the termination of a pregnancy associated with the death of an embryo or a fetus. This can occur spontaneously, in the form of a miscarriage, or be intentionally induced through chemical, surgical, or other means. 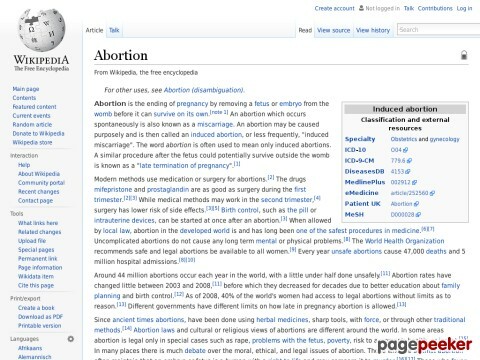 All mammalian pregnancies can be aborted; however, this article focuses exclusively on the abortion of human pregnancy. There have been various methods of inducing an abortion throughout the centuries. In the 20th century, the ethics and morality of abortions became the subject of intense political debate in many areas of the world.